firstly, clogs. just like the tan ones only red. red for summer. secondly, instagram. I may or may not have fallen down a sizable instagram rabbit hole. this is hardly news since I've been on there since april but still. an intervention may be in order. I might have to do that 12 step program with ya. I too am an instagram addict. Your clogs are way cute and so is your insatiable appetite for instagrams. You go girl! and love the red, love. hahaha love it. We are two peas in a pod! 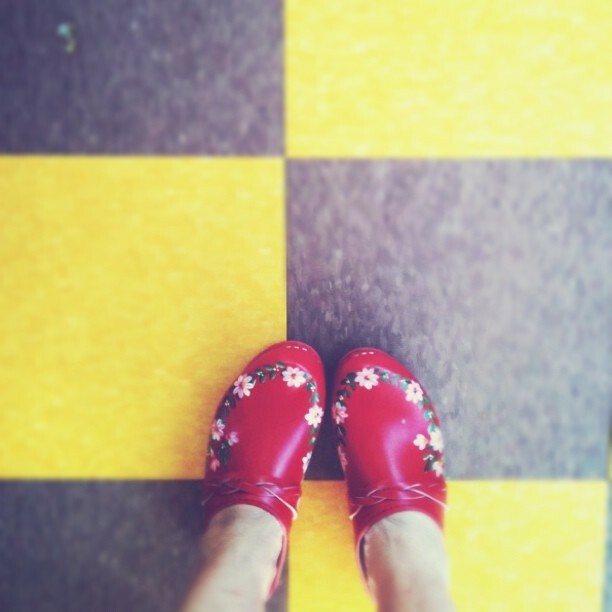 Love instagram of course and so excited that I have fallen in love with me clogs again! I could live in them and oh if they were red I do believe I would! First the clogs rock for sure. Second I am so in the same instagram rabbit hole. I am pretty much obsessed. ohh, i've become totally addicted to instagram. i'd love to follow you. is your user name hula seventy? just found your lovely blog (via some images pinned on pinterest) and am so happy i did! love your polaroids, photo booths, darling children, rainbow colors and wigwam motel (and i've barely scratched the surface). i just (just) started my own blog (www.girlof100list.com/blog.html) and i'm happy to find such inspiration/aspiration.